Little to stand in New Plymouth? If you’re at a loose end in or near Palmerston North tomorrow. This looks interesting and will help raise campaigning money for next years election. 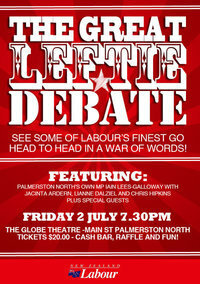 See some of Labours finest go head to head in a war of words. Cash bar, raffle and lefty merriment! From Facebook – is there anyway to link to such notices? Someone should report them to the Advertising Standards Authority. When was Labour last a left wing party? 1979? 🙂 depends how you define left. Personally I tend towards the electable left? This assumes that political parties are simply mirrors of consumer preference rather than actors who have a part in shaping the public political consciousness. I’m not sure that is true. Even then, Labour would have been better off remaining a genuine social democratic party, since it would at least have had something of substance to offer in the last couple of years. Neoliberalism flopped, but supposedly “left” parties like Labour had absolutely nothing worthwhile to say to the voters because they spent the last 25 years parroting neoliberal sophistry. Why would anyone on the left vote Labour? They’re a pack of liberals, not leftists. Who would anyone on the left vote for, Ag? Thanks for that Lew, Ag and myself will probably shoot ourselves now out of sheer despair. The Shade of Robert Muldoon ? 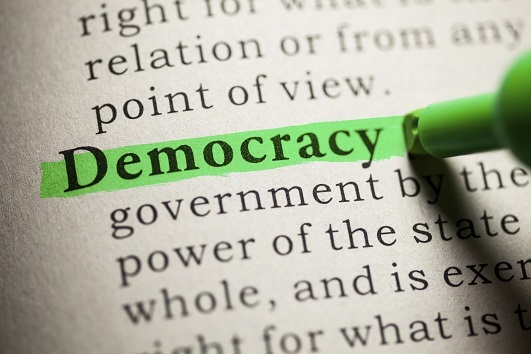 And if the “electable” left is actually right – does that matter, or is it a case of anything to win an election – like Tim Shadbolt when he was looking for a city to lead ” I don’t care where, as long as I’m Mayor, I really don’t care, as long as I’m Mayor…”? I don’t think the Labour party has realised that this almost complete absense of principle is not appealing to the electorate. Labour did make important progress in areas such as homosexual law reform, child discipline, etc. by principled leadership in these areas. Why can’t principle now extend to economic justice, and vision and leadership? And if Labour can lead us into something as extremist and abhorrent to the electorate as Rogernomics, and still get elected, why can’t it now, in the face of economic and environmnetal crisis, with neoliberalism’s reputation in tatters, finally lead us out? Not with Fug in charge, they won’t. national has already shot themselves in the fot with the no smoing in the can rule. it is going to bite them harder than they can ever imagine. No smoking in prison + prisoners can’t vote == no problem. If this is Labours finest I would hate to see their worst. If anybody ever needed a reason to stay well away from Palmerston North this would be it.